Rory McIlroy admits his game is stuck in neutral in his last competitive start before the Open, but believes he would "win every week" if he can start firing on all cylinders. Tournament host McIlroy could only manage a third round of 72 in the Dubai Duty Free Irish Open at Ballyliffin to end his slim chances of winning the title for a second time in three years. The four-time major winner has been pleased with his long game all week but continued to struggle on the greens as he carded four birdies and four bogeys to remain one under par. 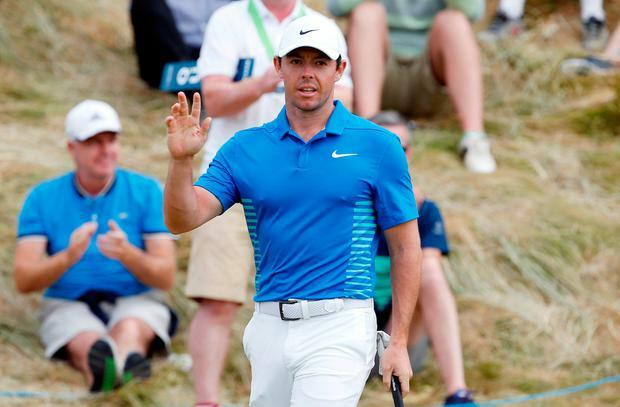 "I'm just sort of stuck in neutral this week and hopefully can finish off with a good one tomorrow," McIlroy said. "I think it's almost to the point where you need to start caring less about whether the putt goes in or not and just make a good stroke. If it goes in, great, and if it doesn't, it's not really a different result than you've had the last few holes. "Tee to green has been really good. I could take my tee-to-green game straight to the Open in a couple weeks' time and be happy where that is. It's just a matter of being a little more efficient and taking my opportunities when I give myself them, be just a little more efficient with my scoring." McIlroy, who will not contest the Scottish Open next week, won the Arnold Palmer Invitational earlier this season with the best putting statistics of his PGA Tour career. And asked what would happen if he could combine this week's ball striking and his putting at Bay Hill, the 29-year-old added: "I would win every week I played. Simple as that. If I had 100 putts every week I played and hit the ball halfway decent, I'd win every week."